ISO 14001:2004 requirements were implemented into the company management system in 2008 so that the company would be ready for the certification audit in 2009. Having passed the audit successfully, the company was awarded the integrated certificate of ISO 9001:2015 – ISO 14001:2015 on 16th March 2018. We prefer the products produced from raw materials which do not exhaust natural resources, we prefer the systems with the lowest possible environmental impact. We chose distribution system with minimal impact on environment. Our commercial operations shall meet or exceed general rules and directives. 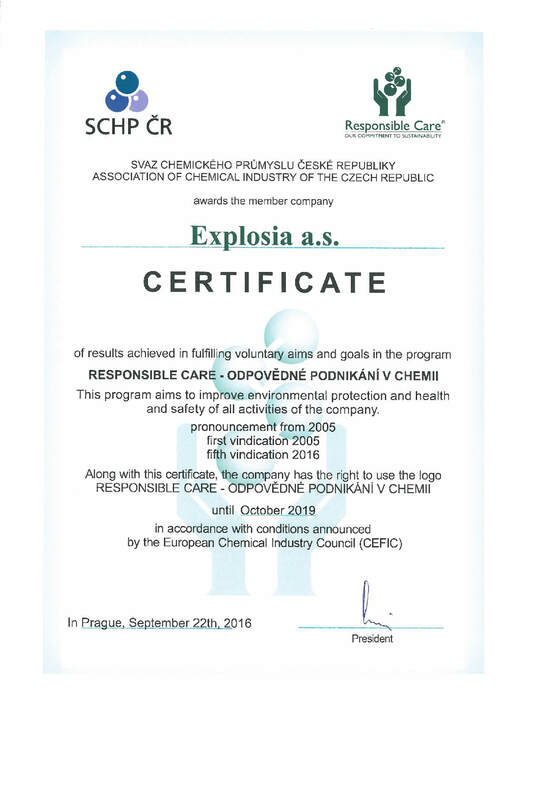 Our objective is the support of use quality explosives and smokeless powders in all processes with the aim to achieve the lowest possible impact on environment. We are active in supporting permanent improvement of integrated management system by our employees and their engagement in this process. Adherence to legislation is a minimal standard and self-evident part of all our activities. Increasing of responsibility for protection of health, safety of work and reducing the impacts on environment are the trends accompanying all activities as well as the workmanship of the products. All employees meet qualification requirements. Conditions are created for permanent improvement of knowledge in the field of technology, protection of health, safety and environment, and also for personal engagement in fulfilment of tasks, following from the company policy. Our customers and distributors are capable of using, transporting and manipulating with our products in responsible, environmentally friendly way. Through open communication we continually inform our business partners, customers and public about the influence of our products and processes on environment. Our business is characterized by open approach in such a way, that the open external communication can be topped by publishing the Annual Environmental Report. Annual Environmental Report is adressed to the widest public, state administration and company staff. 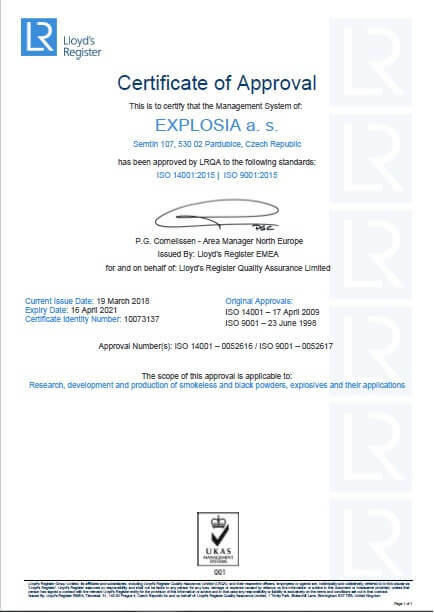 Company management welcomes all your opinions and comments, concerning the influence of Explosia a.s.’s activities on environment, the level of working safety and protection of personnel health.